An acronym for eXtra large IS machine, the ISX is described by Rolf Themann as a beast, with twice the cooling capacity of any other IS machine in the market. 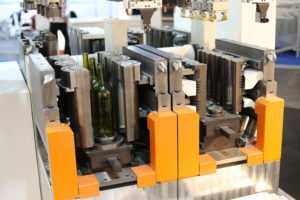 It can cope, for example, with up to 220 tons/day on a single 12-section IS machine in triple gob configuration for wine production or quad gob for beer or energy drinks. Potentially, this means a daily output of approximately 620,000 0.75 litre wine bottles or 1.1 million 0.33 litre beer bottles every day. 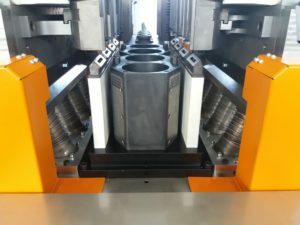 This 1-section ISX 6 1/4in triple gob and 4 1/4in quad gob equipment was exhibited at glasstec 2018. T&T Turnov sro recently unveiled the so-called ISX machine. It can produce very large bottles of up to 1.5 litre wine or spirits in triple gob with a centre distance of two x 6 ¼in (12½ triple). But the machine has to offer much more. Besides the triple gob version, the machine can be changed and upgraded to quad gob with a centre distance of three x 4 ¼in (12 ¾ quad). Or on the other hand, there are also smaller versions of double/triple gob combinations, for example 6 ¼in double gob with 4 ¼in triple gob. The same machine platform is used for all centre distances. This makes for a highly flexible machine. 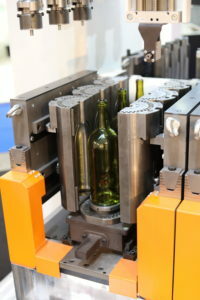 Thus, the production of any still or sparkling wine and Champagne bottles or large liqueur bottles with triple gob finally becomes possible as standard, whereas in quad gob configuration, mass markets such as beer, energy drinks and baby food jars can be produced. The machine uses latest state-of-the-art servo technology components. Section with a 4 1/4in triple gob setup. Valve block for cooling only valves. 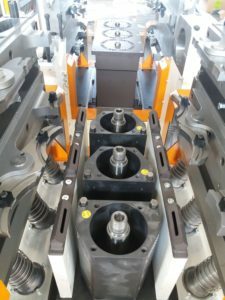 It features a 50% lower energy consumption than conventional IS machines, while ISX sections can be easily and quickly exchanged and replaced in the case of job changes, section damage or exchange. Section exchange takes no more than 20 minutes to complete. To do so, T&T also offers a vehicle to easily remove and insert the entire section. The only precondition is that the ISX machine is installed into the ground in order to have full access, with no height barriers in between the sections and the operator. Table 1: Overview of ISX specifications and ware ranges. Section with 1.5 litre Chardonnay bottles. Section with a 6 1/4in triple gob setup. • Servo-electric mechanisms provide precise, repeatable motion. • Allows for 6 ¼in triple gob production runs at the same speed as double gob. • Allows for 4 ¼in quad gob production runs at the same speed as triple gob. • User-friendly and ergonomic design. • Energy consumption reduced by 50%. • Handles all moulds and sizes, old and new alike. Because glass plants invest heavily in their moulds, this is very important. 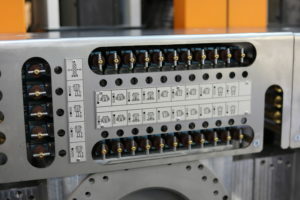 • Highly accurate control system, controlled via the use of 100% Siemens standard components. • Production sizes featuring the widest range of ware sizes, from heights of 15mm to 400mm. • Section-related controls for service independence. • Capable of using all cooling processes: Axial 360° on BB, Vertiflow and InVertiflow on the blank and blow mould sides. and ware ranges are given in table 1.